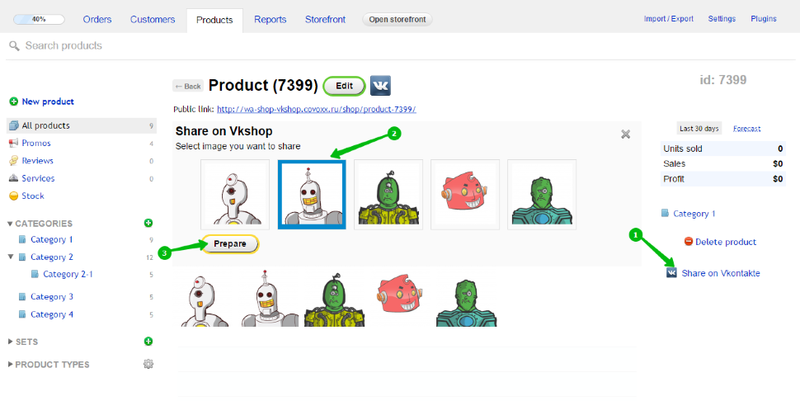 The plugin allows you to massively export goods to Vkontakte group using the Product API. In the setting of the group must specify that the goods are included. All holders of a license for the plugin Vkontakte can get a discount coupon of 30%, referring to the mailbox info@itfrogs.ru and entering the order number and the address of the site to which the license was purchased. Before you take any action for the export of goods in the social network Vkontakte, we must enter the credentials in the settings plug-in and produce the authorization . Push the button, and the exported image selection screen will appear. 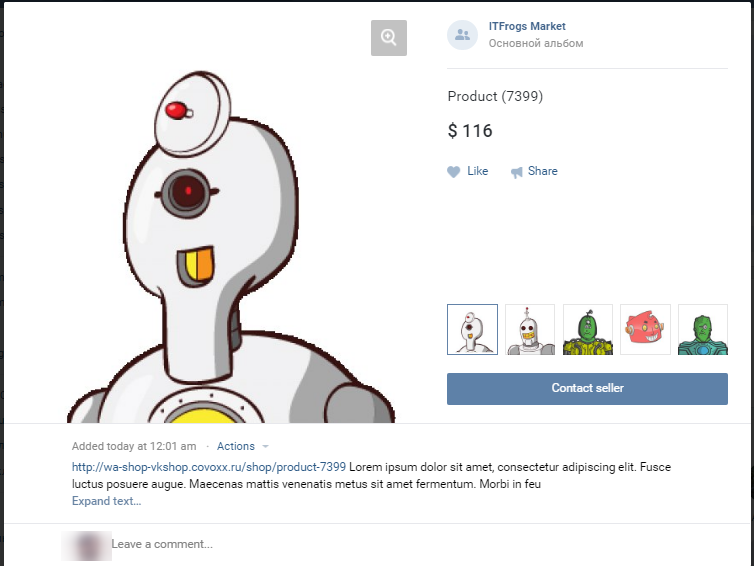 Here we can edit the description, price and other export options. Then press the "Send" button. After installing the plug-in menu lists items for the queue. You can add any number of all goods. Just what products should not be discharged in Vkontakte group (disable goods) can be defined in this menu. Those. you can eliminate some of the export of goods, and then select all the items and throw them in a queue. This will be added to all products, except for disabled. You can not use the service add to the queue and unload goods through lists or types. Once you have completed all the manipulations with the queue, you are ready to export. 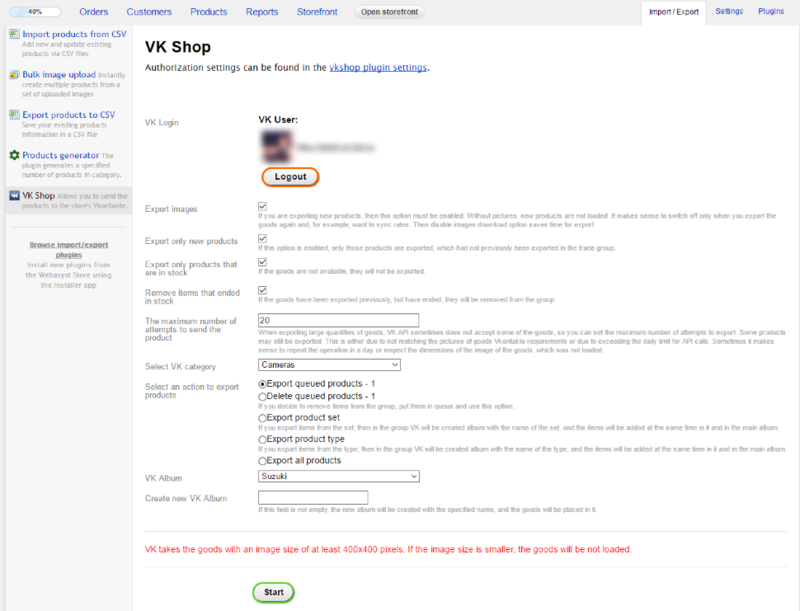 To do this, go to the Import / Export tab, and select the plug-in "VK Shop"
Initially, you can export all products with the default settings. 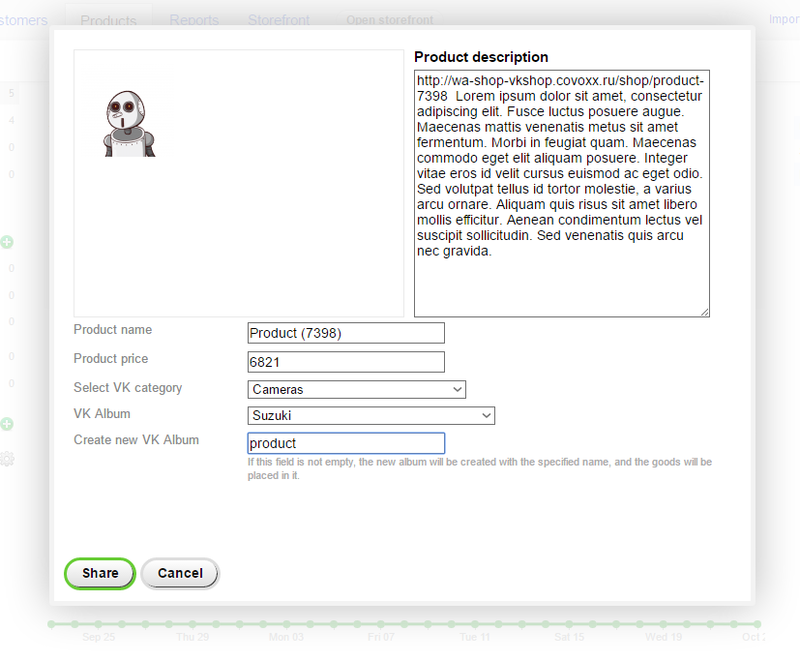 Then, if you disable the checkbox 'Export only new products ", then turn on the editing mode. Information already loaded goods will be actualized. For example synchronized rates. If you switch off mode "Export image", the update process of the goods will take place much faster. Checkboxes to work with warehouses set depending on the operating mode of the store. Please note that if unload goods on the list or type of selection will be created with the name of the type of goods or the list of goods. Sometimes it makes sense to remove, and then perezalit all goods or part of them. In no case does not remove the products directly from the band. Remove items from the group only through the plug. Firstly it is much easier and faster, and secondly, each loaded with goods stored in the database. If you delete items from a group, the plugin will take the goods loaded and will not perceive it as new, and will attempt to update the information about it. The result is that this product will not be unloaded at export. Automatic update of the product in the group immediately after the preservation of the goods. Automatic removal of the group after the removal of the goods in the store. More convenient to work with collections of goods. View a list of items in the queue. A more detailed report on exports.